A Diploma for innovative activities was awarded to Swinbrook Allotments, Carterton from the Office International du Coin de Terre et des Jardins Familiaux, the international allotment organisation with members throughout Europe and Japan in Kortrijk (B) on 25th August 2018. The opportunity to be awarded a diploma is open to all member sites of the National Allotment Society. 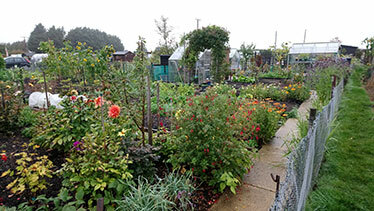 The prestigious award is granted by a panel of international judges and the allotment site must fulfil criteria laid down for the award and submit a presentation of how this was achieved and confirmed by a letter of commendation from the National Allotment Society. Phil Gomersall the rather flamboyant President of the National Allotment Society who represents Gt Britain at the International Allotments Office, travelled to Carterton to present the Diploma to Garry Collicut the Chairman of Swinbrook Allotments, at Carterton Town Hall in the Presence of the Town Mayor, Cllr Martin McBride. New site in Carterton. Also present at the presentation was the Regional Representative of the National Allotment Society Jenny Crawford and a good number of allotmenteers from the site. Following the presentation Phil Gomersall and Jenny Crawford were shown around the allotment site by Mike Alcock, Swinbrook Allotments Secretary and the Mayor to see first-hand all the innovative activities the site was involved with. It is a very popular site with over 30 people on the waiting list. 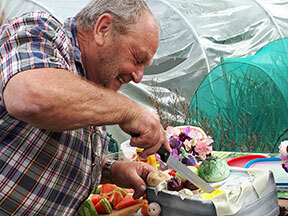 They were also shown one of the two new allotment sites being developed in Carterton as part of a building development. Phil Gomersall was very proud to be awarded the British Empire Medal for services to Horticulture by the Queen's representative to Yorkshire the Lord Lieutenant Mr Ed Anderson at Bowcliffe Hall on Tuesday 23rd October 2018. Phil Gomersall with medal and accompanied by his wife Janet. There were 13 other BEM and 1 OBE recipients at the awards ceremony. In attendance also was the Vice Lord Lieutenant and 10 Deputy Lieutenants including Sir Gary Verity. A very pleasant ceremony it was too. For more information see info flash from 19th June and 30th August 2018. 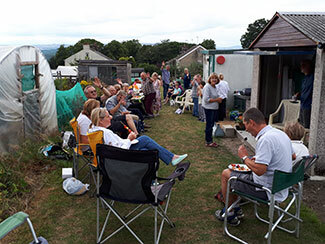 Victory Garden allotments had lots to celebrate at their annual BBQ. It was a lovely afternoon and a great event. Lots of plot-holders turned up which is always a good start. All our plots had been judged a couple of days prior to the BBQ. The celebrations started with the award of a trophy and certificate to Denise Chappel for 'The Best Plot'. Denise has worked really hard on her plot and the results are quite stunning. Michael Egan and John Hattersley both received a 'Highly Commended' certificate. This was followed by a trophy and certificate awarded to Rebecca Chesmore having 'The Best Newcomers Plot'. Rebecca has only had the plot since October last year which is now full of healthy crops. A 'Highly Commended Newcomer' certificate was awarded to Richard Furnival. Our communal store (an old school porta-cabin) is on its last legs but has given us many years of service but has reached a condition which makes it unsafe to use. We had the offer of a large concrete garage 24ft x 10ft and we removed and transported it across the city of Leeds in two vans. It was really heavy work and thanks go out to all who participated in its transportation and re-erection. So our second celebration was the official opening of our new communal building which is looking rather resplendent. The honour was bestowed upon me to cut the red ribbon and officially open it, no half measures here, it was done proper. The third celebration. You will have heard by previous information that I have been awarded the British Empire Medal for services to Horticulture in Yorkshire and my fellow plot-holders gave me three cheers at our last allotment meeting. Although I am extremely honoured to get the award, I do get quite embarrassed when being publicly praised and I thought that wasn't too bad, that done, I can relax a little now. How wrong I was; the Chairman and the Treasurer called me over and then started to tell everyone the tale about all the things I had done in particular for our site since I got a plot 20 odd years ago. Then one of our ladies wheeled up a wheel barrow, and what a surprise, in the barrow was the most amazing cake I have ever seen in my life, not only that but a card signed by nearly all our plot-holders on site as well. I was really touched that my friends on the allotment would do that for me and how they had managed to keep me in the dark about it as I usually know what's going on. What a surprise. There was in actual fact a further celebration as we had a scarecrow competition judged on the day. Graham and Pat Barker were joint first with Linda and Angela from plot 14E. They will receive certificates a little later. 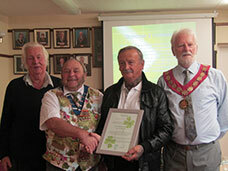 A president and a chairman of the English allotment gardeners were honoured. 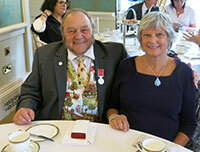 As you read before Phil Gomersall, president of the English allotment garden federation received this year the BEM (British Empire Medal) for his services to horticulture in Yorkshire. Before him Allan Rees, chairman of the English allotment garden federation at that time, received in 2009 the MBE (Member of the Order of the British Empire) for his services to the National Society of Allotment and Leisure Gardeners and to the Royal British Legion in South Wales. 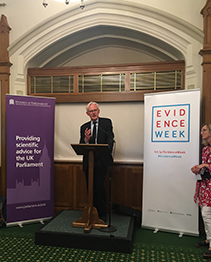 Phil Gomersall, President of the National Allotment Society went down to Houses of Parliament at very short notice on Monday 25th June to give a condensed presentation along with some other groups at the launch of the newly created Parliamentary Evidence Week. We were a huge success and our message was a big hit with all MP's in attendance. Phil Gomersall feels that in future this is a field we can contribute to at Government level. 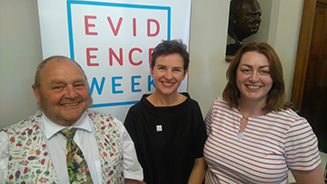 right: Phil Gomersall with Mary Creagh MP, Chair of House of Commons' Environmental Audit Committee and Anne Pike, Somerset Beekeeping Association.